You can find an excellent layout to the Cho’Gall fight here, check it out! I’m honestly thinking this will be easier than Nefarian for us after we kill Capt’n Planet. I thought I’d spend some time looking at everyone’s gear and putting together a list of what items people need from the new heroics to be fully in epics. I favored easier items to get, such as reputations and professions when applicable. So, let’s get right to it! Note: If anyone wants to find the lists I got these from, you can find the armor here and the weapons here. Simply replace the stat weighting system with your class / spec to have it generate the list for you. Edit — Donavaan has been added! Third day of patch 4.1 and FTC has taken down both of the new heroics! Good times, and we can definitely see that these instances are going to clear up a lot of the loose blues we’ve got in our character slots. 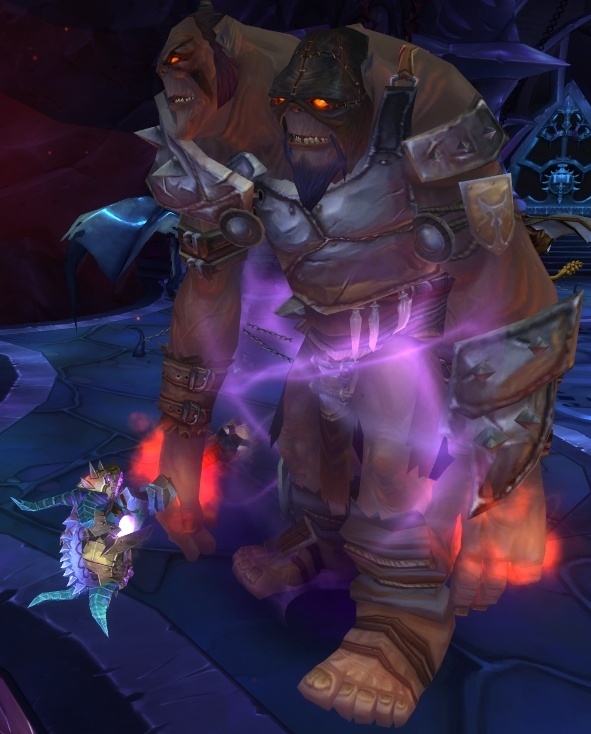 Wowhead has a great, concise table of strategies / abilities of the bosses in each of the new heroics. Definitely worth a look, it can be found here. I thought I’d put together a list of quick “remember this” parts of each fight if you haven’t seen one instance or the other. Zul’Aman hasn’t changed a great deal from what it was when originally released. The only boss with a significantly new ability is Akil’zon, who instead of rocketing people into the air will now call birds to carry off party members. Here is the quick laydown of the fights. Special Notes: Being kidnapped does not prevent you from doing damage or healing. Electrical Storm is the killer in this fight – if you are not under the lifted party member, you die. If the boss is casting Electrical Storm, stand under the player up in the air. Kill the Amani Kidnapper (Giant white bird) who has one of the party members. Kill the boss while spread out. Dispel Static Disruption, this is mana intensive and happens a lot. Keep an eye on the health of any party member being kidnapped. Heal as normal while spread out. Keep the boss in a generally central area of the platform to allow people to spread out. Tank as normal, adds cannot be controlled. Special Notes: This boss requires movement to make sure no one get’s Surged twice in a row. If you do not have at least three ranged (including healer), then melee may be required to move out to ensure no one else dies. Set up a rotation ahead of time to make sure 3 people rotate who is farthest away from the boss, any less than three and one person will get surged twice. During bear phase, this does not apply but party members should be ready. Move out to farthest away from the boss if you are up on the rotation – this is more important than DPS. DPS the boss while ensuring you’re not farthest out. Move out to farthest away from the boss if you are up on the rotation. If boss is in bear form be prepared for heavy healing on the tank and occasional silences. Heal as normal (tank heavy healing fight). Keep boss steady so DPS and healer can move as per the rotation. Use cooldowns when boss is in bear form and applies both bleed effects. Special Notes: At 35% he frees all remaining unhatched eggs – this can lead to a wipe if DPS goes too fast on the boss and not enough eggs are released earlier. Once the eggs are at a low level, let the boss hit 35%, kill all the adds then burn down boss. DPS should kill one Hatcher, let one hatcher open several eggs (7-12) then kill that hatcher. Do not die to the fire bombs. Hatchers open eggs VERY quickly. Do not stand near fire bombs, move to a safe place. Spread apart and when targeted by the boss with Flame Breath, move out of the line of fire until it fades. Kill hatcher you are assigned to. If most eggs have been hatched, bring boss below 35% and kill adds. Be prepared for dragonhawk adds. Dragonhawk adds will debuff their target with additional fire damage taken, can be dispelled. Heavy tank healing and a frenzy sub 20%. Pick up adds so DPS can kill them. Tank the boss in a generally central location to allow DPS / Healer to spread out. Save cooldowns for mass hatch sub 35% and frenzy at 20%. Special Notes: Water Totem can either be killed or just outright avoided. Corrupted Lightning Totem can be killed by the tank. Phase changes at 66% and 33%. Kill Water Totems if necessary. Kill Spirit of the Lynx (during second phase). Kill Boss (during phase 1 & 3). Fairly descent damage to tank during phase 1 & 3. Large amounts of random damage during phase 2, spirit of lynx has no aggro table. Keep boss out of Water Totem area of effect. Spirit of Lynx has no aggro table, kill Corrupted Lightning Totems during phase 2. Special Notes: Adds can either be crowd controlled the whole fight, or killed. Special abilities are drawn from party members present. Kill adds if they are not being Crowd Controlled. Avoid standing in fire or other harmful area of effects. Dispel harmful effects if possible. Large amounts of AoE damage. Tank damage can vary depending on boss’ current abilities. If adds are not being CCed, tank adds until dead. Tank boss generally in a central location. Move him away from harmful ground effects. Special Notes: There are only three phase changes during this fight, at 66% and 33%. Phase 2 and 3 are random amongst four animal spirits. Phase 1, DPS boss and avoid whirlwind if possible. Eagle Phase: Avoid Cyclones, kill Lightning Totems, kill boss. Watch self damage if you are a spellcaster. Bear Phase: Move out if your are up on rotation for the Surge ability, DPS boss. Dragonhawk Phase: Avoid Flame Columns, DPS boss. Flame WW is unavoidable. Lynx Phase: If you are targeted by Claw Rage, use vanish / ice block / bubble / feign death / etc to avoid damage, DPS adds, DPS boss. Phase 1, heal those affected by Grievous Throw to full health, heal as normal. Eagle Phase: Avoid Cyclones, watch self damage. Bear Phase: Move out if your are up on rotation for the Surge ability, dispel Creeping Paralysis off tank. Dragonhawk Phase: Avoid Flame Columns, flame WW is unavoidable. Lynx Phase: If you are targeted by Claw Rage, use vanish / ice block / bubble / feign death / etc to avoid damage. Phase 1: Tank generally centrally. Eagle Phase: Avoid Cyclones, kill Lightning Totem, boss may be immobile. Bear Phase: Use cooldowns after creeping paralysis. Lynx Phase: Taunt boss after he starts attacking someone Claw Rage, use cooldowns as this will destroy you if you take the full duration of the attack (ideally split damage between you and the original target). I’ll put up an explanation of Zul’Gurub soon! I know that sounds obvious, but it would appear that we have not got Halfus on farm yet. Last night was a combination of needing more gear and a strategy that wasn’t terribly effective. At this point, I’m fairly sure we’ll need to free two drakes to get him down when there is that much AoE going on. Beyond that, our attempt on Bastion of Twilight is done this week, next up is the Conclave of Wind! We’ll be hitting that Monday and I have a strong feeling that they won’t hold against our assault. The Conclave is all about execution and I know we have the gear to destroy them. I’ll post a quick strategy with links a little later today.